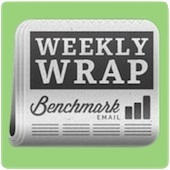 In this edition of The Weekly Wrap we give you the latest and greatest offerings from Benchmark Email, and you can find out what shot to buy me on my birthday. I know! A win-win for all. Benchmark Email has taken another step int our Wall-E-esque future quest to make your lives as easy as possible. Now you can Integrate Your Highrise CRM Contacts. For someone with an iDevice always attached to my hand, I can’t decide if Google Glasses would be my final descent into antisocial-ness or if it would improve it. Read about how Google Glasses Seek an Audience (and Justification). For as much as I despise my cable company (and I truly and deeply despise Charter), I’ve found I can get things done by complaining about them on Twitter. Find out How to Use Social Media for Customer Service. The Gentlemint Model of Pinterest...For Men! I can never remember if the flavor of gum I like is spearmint or gentlemint... Read about The Gentlemint Model of Pinterest...For Men! Is there any way they could make this a Pay Per View Battle Royale? I’d pay to watch Google Facing Off with Twitter, Facebook over Valued Data. Also known as “Reasons to Spend $1 Billion.” Check out these Marketing Lessons from Facebook’s Instagram Takeover. Get yourself a T-Mobile girl (don’t mind if i do!). Find out How Online Marketers Can Emulate T-Mobile’s Branding Overhaul. My dad would be proud to know that after reading this headline, all I could think of was if the golf course would have dried out after this morning’s rain by this afternoon for a quick nine holes. Read about how Facebook’s New Timeline Format Tees Off Online Marketers. Toast Your Subscribers with Cinco de Mayo Email Templates! What’d you do at work yesterday, you ask? Oh, the usual...and write about how I like drinking tequila. Yes, sometimes that’s work (the writing about it, not the drinking). This May 5th, Toast Your Subscribers with Cinco de Mayo Email Templates! We just made your life easier. You’re welcome! That’s right, the New Easy List App Collects Email Addresses Right from Your Laptop.